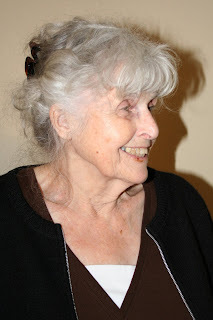 April Kennedy...My Life + My Style: HAPPY 80TH! This is my Grandma Joan. Isn't she pretty? Today we celebrated her 80th birthday and I reflected on all the things I love about Grandma. My earliest memories of Grandma Joan were sleep overs at her house and Shirley Temples with extra cherries in the car while waiting outside the bar for her little visit with her bartender boyfriend. She never stayed long...just long enough to get me those cherries! I remember always having fun with Grandma and Aunt Tami. She raised four children, adopting their last and youngest child, Tami. I admire her desire to adopt and need to make a mental note to dig deeper with her regarding that desire. My dad was raised in a good home, a loving home where Grandma wore her apron cooking, mending and cleaning and Grandpa worked hard as a carpenter and then came home and built fun 'carnival' rides for the boys to play on out of wood. You should see some of their home videos! I have asked Grandma many times how she raised four children and kept her sanity. She has told me that they stayed home much of the time and didn't have the crazy schedules like we have now. Sometimes I long for the good ole days of Grandma's time. Grandma and I really didn't get to know each other until I was married with children. But as I got to know her I realized we have a lot of things in common. And those were the things I reflected on today. We both love to stay current and up-to-date in our clothes, shoes and purses and also in our home decor. Quite often when I stop by her house she has the same magazines sitting on her coffee table that I have marked up at home on mine. We both share a love for great grandma's quilt pieces, trendy wall colors and old painted furniture. We both love game shows and movies with 'feel-good' endings. And we both share her gray hair. I am desperately covering mine up for now, but look forward to the day (hopefully closer to my eighties) when it is a beautiful silver color like hers. It was a good day today. And a reminder that I need to spend more time with Grandma! Very nice post! However, I think I have you beat in the gray department. I am having a hard time keeping my covered! You look great! I would never have thought that you had any gray. Such a sweet post about your grandmother. I lost my grandmother 4 years ago this May and it never ceases to amaze me how her influences on me as a child and young woman have played out in my adult life. I am so glad that you still have your grandmother in your life, continue to cherish your time together. Today was a perfect celebration for Grandma Joan. The most influential person in my life was my grandma...so I know how special a grandma is. You'll have to bring your laptop to her house and show her this special blog you created about her day. Thanks for posting our family event!